In the spring and summer time in Minneapolis, bugs seem to come out of nowhere and before you know it, you have a severe infestation that the over the counter pest control products can’t seem to touch. If you’re in this type of predicament right now and are not sure where to turn, know that the Minneapolis exterminators at Eco Tech are here for you. Offering eco-friendly pest control solutions, we’ll not only take care of your pest control problem once and for all, but we’ll do it with our all-natural pest control solutions to help protect you, your family and your pets. Eco Tech has been a leader in providing eco-friendly pest control solutions to residents in the area for decades. Our experienced team of Minneapolis Exterminators have more than 50 years of combined experience that they bring to each and every home or commercial property that they service. Our experienced pest control technicians work extremely hard to stay abreast of the latest in pest control treatment methods to ensure our customers are always receiving the highest level of service in the industry. Below are just a few tips from the Minneapolis Exterminators at Eco Tech on how you can do your part to prevent the infestation of pests in and around your Minnesota home or office. Clean up often – This is especially true in kitchen and bathrooms. Wash dishes, wipe counters and sweep up any debris on the kitchen floor daily if possible. 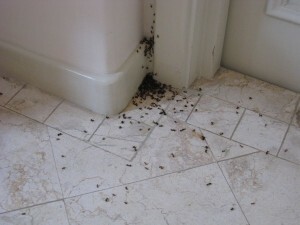 Keep cabinets clean – Check kitchen and bathroom cabinets often and remove any debris that may be attractive to pests. Seal all food tightly – Make sure insects aren’t able to get into packages of sugar, cereal, etc. Keep crackers and bread in sealed containers if possible. Securely store pet food – Store pet food in sealed containers. Vacuum often – Vacuum carpets often, especially if you have dogs or cats that can track in fleas. Seal cracks – Seal cracks around doors, windows and openings where utilities enter your home or office. These are just a few of the many ways that you can help to prevent pests from infiltrating your home or office. Give Eco Tech a call to learn more tips on how to reduce the number of bugs in your home this year. Remember that even if you have the cleanest home in Minneapolis, chances are you’ll have a problem with bugs at one point or another. When you do, know that the licensed and insured Minneapolis exterminators at Eco Tech are here for you. Give us a call anytime at 763-785-1414.